If you market, sell, price, administer and support Medicare insurance solutions we invite you to join us in Atlanta for outstanding sessions and networking opportunities. One day … one special opportunity to attend workshops — meet with 80+ exhibitors. FREE REGISTRATION when you request your free access pass to attend. 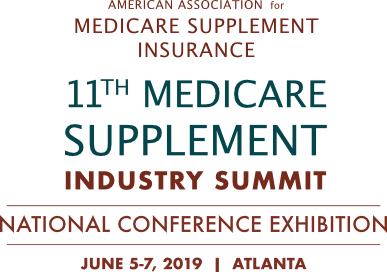 The Medicare Supplement Insurance Industry Summit is the only national conference that exclusively focuses on Medigap insurance. Over 730 industry leaders attended the 10th (2018) Medicare Supplement Insurance conference held in St. Louis, MO. Between 300 and 400 attended our free day for agents program. Over 84 companies were sponsors and exhibitors at this event. We invite you to participate as a sponsor or exhibitor or as an attendee. Complete information can be found on this website. Click the CONFERENCE tab above to display the pull-down tabs. Don’t Miss The Only Conference That’s 100% Medigap! The 2019 Medicare Supplement industry Summit will be the 11th gathering of industry leaders. The first conference took place in 2004 in Dallas, Texas and was set as a one-time event, an opportunity for industry executives to come together. About 140 attended. A second Summit was requested and took place in New Orleans in Spring 2006. In fact, the event had the distinction of being the first conference held in the city following Hurricane Katrina. Clearly as the Medicare Supplement insurance industry has grown, so has the conference. The American Association for Medicare Supplement Insurance (AAMSI) was formally established to organize and produce the event. Over time, AAMSI has expanded its work on behalf of supporting the Medigap industry and those professionals who earn their living by offering Medicare Supplement solutions. We thank the many individuals and organizations who play a vital part in this event and look forward to greeting hundreds of you in Atlanta.